So, it’s that time of year again. Valentine’s Day is fast approaching. Here’s a few Valentines Day gift ideas for those looking for inspiration! I was rather surprised to see a range of Valentine’s gifts in Aldi, and their products are actually quite impressive. 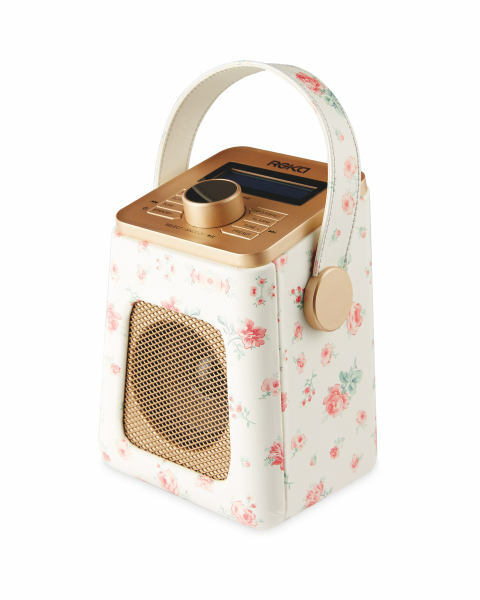 I love this floral radio priced £29.99. It says Valentine’s gift but is also a quirky yet functional gift, perfect for the office! Of course Lush have provided us with some excellent Valentine’s Day gifts! As always, their products in this range are high quality and perfect for the occasion. Treat your loved one to indulgence with these ‘lush’ gifts! I must admit, tea isn’t the first thing that springs to mind when I think of Valentine’s Day, yet for tea lovers, this is the perfect gift! Twinnings offer Valentine’s Day Gift gift sets. My favourite is the ‘Be My Valentine Gift Bag‘ priced £14.00, comprising of a caddy of English Breakfast tea and luxury truffles. Valentine’s Day can be the time for practical gift giving, an opportunity to give those presents we wanted to at Christmas, but didn’t. My husband always needs a new grooming kit at this time of year and I him a Remmington set available at Debenhams for only £20.00! Keeping with the practical theme, I found this beautiful Nicky Clarke hairdryer in Boots as part of their Valentine’s gift range. This is a bargain at £36.66 – reduced from £54.99. Gift experiences make excellent gifts and are available at many different stores. We are rather partial to afternoon tea in our house. This couples gift from thegiftexperience.co.uk is perfect for us! Afternoon Tea for two at Patisserie Valerie Plus 4 slices of Cake to take home all for £35.00.